In the present economic environment, 40 students passionate about macroeconomics have tried to find the right solutions to the chronic economic crisis that seems to have overcome by a long length the simple cyclical change it subscribed to at first. This experience has left participants with strong knowledge and answers to stringent questions, at a level, so far addressed to established economists only. In addition, participants were given a platform to reach personal opinions concerning the consequences of the financial collapse, the easy predictable as well as the unpredictable ones. – Camalia Savoiu, communication manager at Lafarge Romania. Selection of participants was made through an application form, followed by an interview. Economics through a Macrofying Glass has as standing pillar the ambition of a young community of high potential students to change the current economic, social, and political environment. Partners: Expert Serv, Raiffeisen, Mazars, Lafarge, Libertas , Cafe Bohme, and Violeta’s Vintage Kitchen. Economics through a Macrofying Glass consisted of a series of seminars on macroeconomics and public policy with guests from the World Bank, IMF, the National Bank of Romania, Bancpost and Ensight Management Consulting. This project has its tradition beginning with 2002. A numer of 40 participants were carefully selected. What makes this project unique is the fact that our special guest, Mr. Lajos Bokros, shares his knowledge and experience with students during 10 days of seminars. This knowledge was acquired while working as a director at the World Bank, Minister of Finance and President of Budapest Stock Exchange. Econosofia Debate Sessions is a project where the discussions become intense. It represents a series of debates on macroeconomic subjects preceded by trainings on communication, public speaking and debate skills. 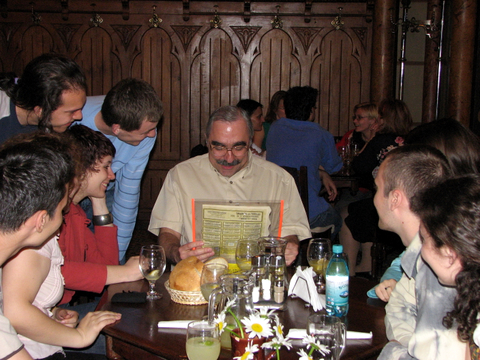 At its second edition, EDS 2008 tried to bring together students from all Bucharest Universities interested in their personal and professional development through non-formal education. Due to its contest format, this project will foster the students’ will to continuously educate themselves and develop an analytical way of thinking. 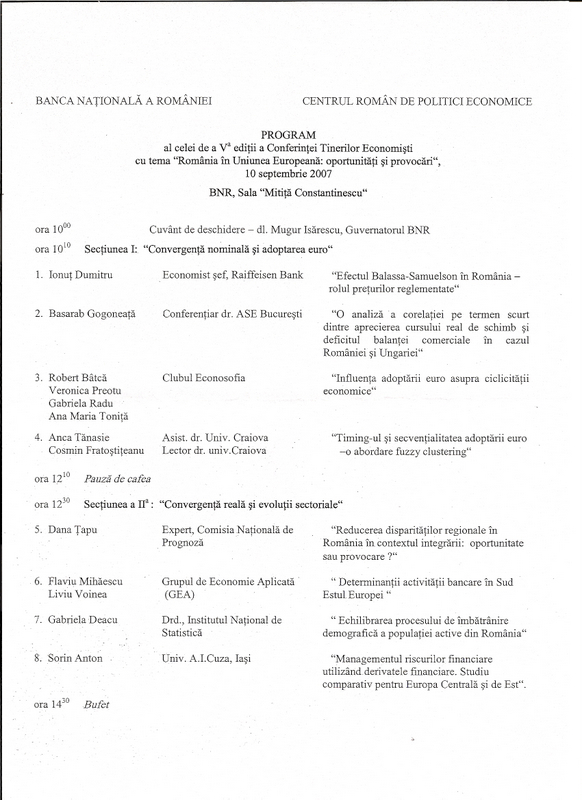 On 10th of September 2007, the National Bank of Romania (NBR) and the Romanian Center for Economic Policies have organised the “Young Economists” conference, on the subject: “Romania in the European Union: opportunities and challenges”. Participants were selected from researchers, academia and Romanian students under the age of 35. The Econosofia team had the opportunity to present its paper The influence of adopting the Euro on economic cycles. This paper examines the synchronisation between business cycles in Romania and countries from the euro area, using comparisons and a control group. The authors’ second purpose was to observe whether business cycles’ synchronisation between euro area countries grew as they adopted the euro, to prove the endogeneity of the OCA. The paper will be published by “Editura Enciclopedica”. The project consisted of 8 days of seminars with our special guest and has offered the opportunity to the participating students to study thoroughly some issues concerning real and nominal convergence to the Euro Area. This project is unique in our country because the participants are acquainted with the World Bank expertise through the seminars held by Prof. Lajos Bokros, World Bank director (1996-2004). This expertise will foster the comprehension, understanding and determination of solutions by the students to the problems that East European countries face in joining the Euro zone. The projects was also honoured by guests from the Romanian financial sector of our country like: Mihai Ion, president of Raiffeisen Asset Management; Florin Ilie, Head of equity markets department at ING bank; Valentin Lazea, chief economist at NBR; Florin Cîţu, chief economist at ING România; Mugur Tolici – advisor at NBR; Anca Paliu Dragu – economist at IMF Romania. These guests have discussed with the participants issues of great importance in joining the Euro Area. 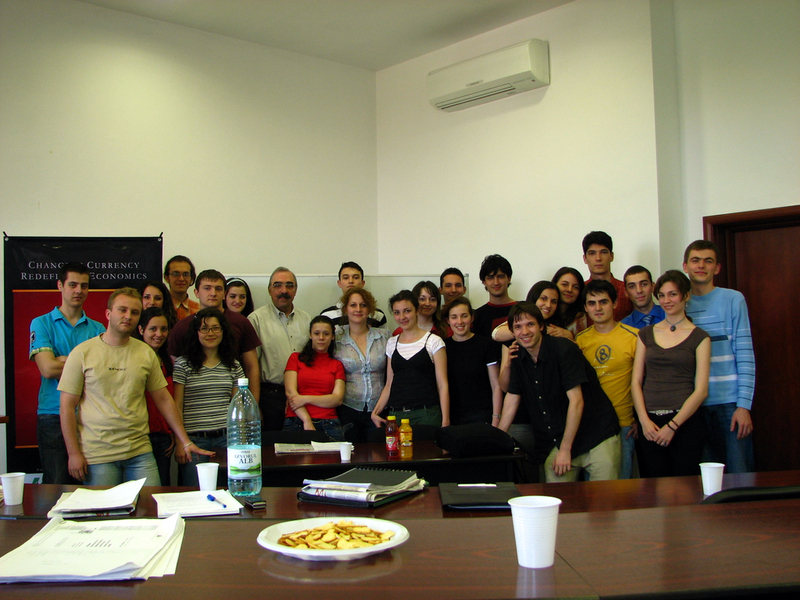 The longest project that Econosofia club has ever organised, it consisted in debate skills trainings during 2006 and in 5 months of weekly debates in 2007 on economic and political themes. At each debate we had the opportunity to invite a special guest working within the debated issue area. The format of these discussions was an open table. Also, during this project we managed to organise 3 open forums on the European integration of Romania. At the end of this project we can say that we have achieved our goal, because the participants have evolved in their capacity to argument and in their public speaking skills. Moreover, they have acquired knowledge in the economic field. We believe that this project was a challenge not only for the participating students but for us too, because it involved a whole year of hard work. Guests of our round tables and forums: Dragoş Pîslaru, Managing Director GEA Strategy & Consulting; Cristian Pîrvulescu, President of the Pro-Democracy Association and Dean of the Faculty of Political Sciences SNSPA; Mircea Vasilescu, chief editor Dilema Veche; Sorin Ioniţă, Chief Researcher of the Romanian Academic Society; Sorin Cucerai – liberalism.ro; Liviu Voinea, Managing Director GEA; Sever Voinescu, journalist at the Cotidianul and Dilema Veche; Lidia Moise, Macroeconomics Editor of NewsIn; Radu Vasilescu, Managing Director ING life insurance services. This is the first online journal in Romania which publishes articles written by students. It is a monthly journal, open for all students, in which the articles are selected by members of the Econosofia Club. The journal is divided into 5 parts: Economics, Financial Markets, International Affairs, Companies and Analyses. In order to facilitate the dialog between the writers and the readers, the journal has allowed online comments for the readers. We believe that this journal will help the students develop their writing skills. The online format was preferred instead of a formal one because the online press is becoming increasingly popular throughout the world, especially among young people. This year we have transformed the online journal into a blog. The main objective of this project was to select the best 40 students with great potential to become future professionals and to provide them the opportunity to understand some key economic issues. In the same time we strived for promoting a dialog between the young participants and our guests from different economic sectors. The event has benefited from the exclusive presence of Prof. Lajos Bokros, former World Bank director 1996-2004. Arriving for the 3rd consecutive time in Romania, Prof. Bokros has offered the students the chance to learn from a true specialist. Among the topics discussed were: communist period influence on Romanian economy, economic transition, the post communist privatisation process and other fiscal policies. Also, during our sponsor’s Lafarge Lunch Break, the students had the opportunity to interact with top managers from Lafarge Romania: Camelia SĂVOIU, Sorin PETRESCU, Gabriel MĂTĂUAN and Corneliu FECIORU. At the end of the Economics through a MacroFying Glass project, we organised an essay contest on Monopoly versus Oligopoly, in partnership with our exclusive sponsor – Lafarge Romania. The winner of this contest received a study trip to Paris at the headquarters of Lafarge Corporation. Risk Management was intended as a series of seminars on risk related issues. The seminars were held by notorious guests from the Romanian economic sectors, guests that dealt with risk management problems during their daily activities. In this sense, the participating students have encountered a more practical approach on subjects they study during their courses at the university. Our guests were: Lucian ANGHEL, Deputy executive at BCR Treasury Department; Bogdan BALTAZAR, Senior Partner & President, Baltazar, Bloom & Pîrvulescu; Răzvan SZYILAGYI, Assets & Liabilities Manager,Raiffeisen Bank; PhD. Victor DRAGOTĂ, Faculty of Finance, Insurance, Banking and Stock Exchanges, AES Bucharest; Radu LIMPEDE – financial analyst; Ion LUPU, Clearing Department director, Romanian Commodity Exchange; Cristi TUDORESCU, Senior Analyst at Vanguard. The seminars had a broad range of discussion topics like market risk, business related risks, equity risk, gap approach, commodity risks and foreign exchange risks. Moreover, students have obtained a close empirical understanding of notions like VAR, RAROC, internal risk related models, stress testing and scenario analysis of the interest rate risk. This was a 5 day seminars’ session recommended for undergraduate and graduate students on the challenges that a functional market economy faces. Guests: Prof. Lajos BOKROS, PhD CEU Budapest; Mugur ISĂRESCU, Governor of the National Bank of Romania; Ionuț POPESCU, Minister of Finance; Valentin LAZEA, Chief Economist of NBR; Prof. Daniel DĂIANU. Subjects discussed: the flow of funds in an open economy; links between the fiscal policies and the current account; options of macroeconomic policies in a transition economy; restructuring and privatisation of public enterprises, financial sector modernisation; links between the financial sector and the restructuring of an economy. This was the second edition of the EU simulations on related European issues as the previous edition. This time the participants had the opportunity to get an insider’s perspective on the negotiation process from Leonard Orban, chief negotiator with the EU. Also, we have invited such remarkable guests as: Răzvan Mihai UNGUREANU, Minister of Foreign Affairs; Ene DINGĂ, Minister of European Integration; Ion CRISTOIU, journalist; Sorin Roșca STĂNESCU, journalist; Robert TURCESCU, journalist; Stelian TĂNASE, journalist; Mihai CONSTANTIN, journalist; Bogdan CHIREAC, political analyst; Cristian PREDA, political analyst; Toader PALEOLOGU, political analyst; Gabriela DRĂGAN, Director of the Romanian Institute of Economic Studies;, Dorin MÂNTESCU, advisor of the Ministry of Finance; Cristian PÎRVULESCU, President of the Pro-Democracy Association. The project was organized in the form of conferences with the objective of instructing the participants on the role of European institutions. It was addressed to students interested in the decision making process and the institutional structure of the EU. It ended with a simulation of the process which took the structure of a debate, where each participant took the role of representing a particular country or European institution directly involved in the debated issue (ex: budget deficit, Turkey joining the EU, illegal immigration). Our guests were: Nicolae IDU – Director of the European Institute of Romania; Marene SVENDSEN – Minister of European Integration; Cristian PÎRVULESCU – President of the Pro-Democracy Association; Laurențiu DINU – Advisor at the Ministry of European Integration. 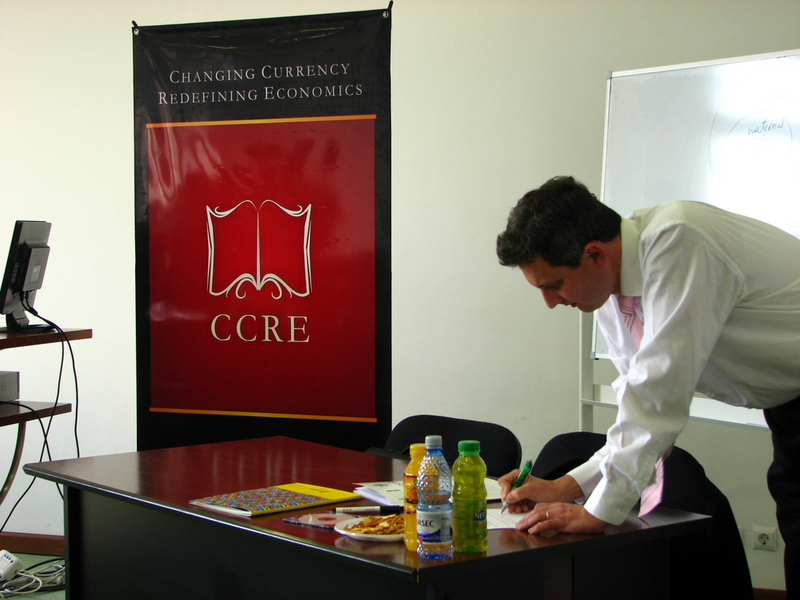 The seminars were held by specialists in monetary theory and practice and had mostly a debate structure. Among the debated issues we can recall: the evolution of the monetary policy in Romania after 1990; the influence of the foreign exchange policies on the current account deficit; challenges for the monetary policy in 2005(electronic payment system, full liberalization of the capital accounts, national currency denomination, transition to inflation targeting); interconnection of monetary and fiscal policies in Romania. Guests: Teodor BUFTEA, Director of the Monetary Policy Department of NBR, Eugen DIJMĂRESCU- Vice governor of NBR, Valentin LAZEA – Chief Economist of NBR, Prof. Daniel DĂIANU, PhD Claudiu DOLTU. Objectives of the conferences: creating a proper environment for discussions between the decision makers in the Romanian society and the participating students, future decision makers; understanding the contribution of youth in the Euro-Atlantic integration of Romania; establishing a community of future leaders and specialists in economics and policy making. Guests: Mircea Geoană, Minister of Foreign Affairs; Jonathan SCHELLE, chief of the European Commission delegates in Romania; Hildegard GACEK, Director EBRD Romania; Martin QUINN, Enlargement Department of the European Commission; Vasile PUȘCAȘ, chief negotiator with the EU; Prof. Mugur ISĂRESCU, Governor of the National Bank of Romania; Mihai TĂNĂSESCU, Minister of Finance; Bogdan BALTAZAR, President BRD-GSC; Enache JIRU, deputy secretary at the Ministry of Finance; Eugen DIJMĂRESCU, Minister of Commerce; Ionel BLĂNCULESCU, Minister of Control; Stere FARMACHE, General Manager of the Romanian Stock Exchange; Dan PASCARIU, President of HVB Romania; Prof. Nicolae DĂNILĂ, President of BCR; Radu GHEȚEA, President of the Romanian Banking Association, Vice President of Alpha Bank; Elena PETCULESCU – President of BancPost; Florin POGONARU, President of the Romanian Businessmen Association; Dinu PATRICIU; Ted LATTIMORE; Graeme JUSTICE, IMF Romania. This program has offered us the opportunity to manage 100 internship positions for such institutions as: the National Bank of Romania, the Ministry of Industries and Resources, European Commission delegation to Bucharest. The event has reunited the best 40 students interested in the topics discussed. Our aim was to clarify the stage of structural reform in Romania for our participants. Moreover, we tried to create an open environment so that the guests could take into consideration the ideas which students came up with. Among the themes discussed we can recall: Structural reform in the Central and Eastern Europe, institutional reforms, agreements with the international financial organizations, the privatization of large state-owned enterprises, arrears in Romanian economy, financial discipline, small and medium enterprise role in the Romanian economy, Romanian business environment and investment opportunities. Guests: Prof. Lajos Bokros, CEU Budapest; Adrian Năstase, Prime Minister of Romania; Jonathan SCHELLE, chief of the European Commission delegates in Romania; Prof. Mugur ISĂRESCU, Governor of the National Bank of Romania; Mihai TĂNĂSESCU, Minister of Finance; Bogdan BALTAZAR, President BRD-GSC; Fergus CASS, President of the Council of the Foreign Investors in Romania, President of Unilever South Central Europe. Special guest. Leszek BALCEROWICZ, governor of the National Bank of Poland – in partnership with the Polish Embassy in Romania. Dan Pascariu – President of HVB Romania, Iosif Pop – President of Banca Transilvania and Radu Grațian Ghețea – Vice-President Alpha Bank – evolutions, trends and problems of the Romanian banking system. Ionel Blănculescu – President of AVAB and Nicolae Cinteză – Director of the Control department of the NBR – problems concerning credit in Romania. 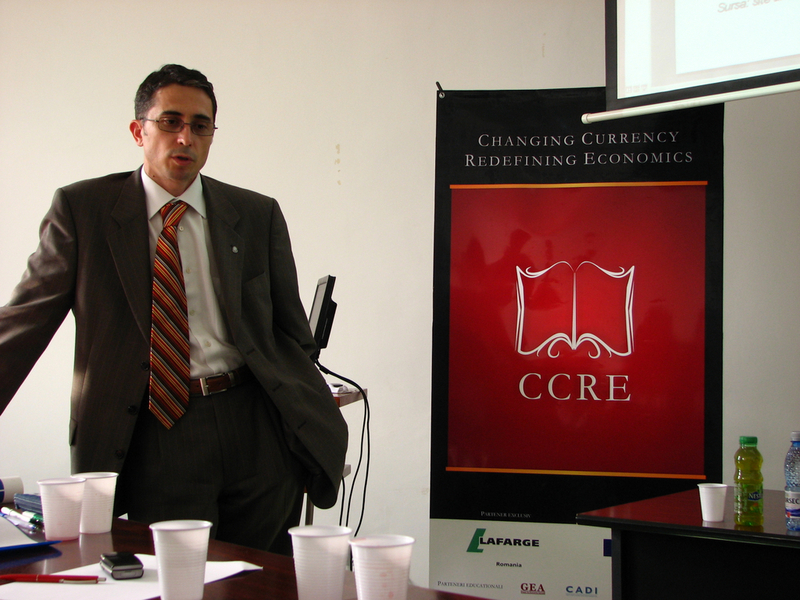 Valentin Lazea – Chief Economist of the NBR – Monetary policiy and its effects. Foreseeing the bankruptcies. Laurențiu Mitrache – Vice-President Volksbank Romania, George Mucibabici – First Vice-President of the Commercial Bank “Ion Țiriac” and Ilie Mihai – Vice-President of Banca Comercială Română – the reform in the Romanian banking system. Liviu Cotora – Managing Director INTEGRATOR SAP ROMANIA – Risk Management: model approach and IT solutions for the risks. Maria Buga – Equity Markets department Executive of BRD-GSG, Anca Dumitru – Managing Director RASDAQ, Paul Ichim – adviser of the Ministry of Finance, Septimiu Stoica – Vice-President of the Bucharest Stock Exchange – Capital markets and the Romanian banking system. Bogdan Baltazar – President of BRD-GSG – privatisation in the Romanian banking system. Prof. univ. dr. Varujan Pambuccian – President of the IT&C commission of the Parliament and Radu Negrea – secretary of the Romanian Banking Association- trends in the Romanian banking system. Elena Petculescu – President of Banc Post – privatisation of banks. Salvatore Candido – EBRD Executive, Prof. Daniel Dăianu, Sorin Teodoru – Financial Sector Specialist at the World Bank, Florin Pogonaru – President of the Romanian Businessmen Association – the Romanian banking system and the international financial system. Petre Bunescu – Deputy Manager of BRD-GSG, Doru Lionachescu – Vice-President Citibank – Credit in the Romanian economy. Prof. Violeta Ciurel – General Manager of Retail Operations of ING Romania and Fănel Plopeanu – Vice-President of Omniasig, Bogdan Andriescu – President of UNSICAR and Gabriela Gavrilescu – Director of the National Insurance Control Agency – Romanian banking system and the insurance market. Prof. Mișu Negrițoiu – Manager Corporate Financial Services & Investment Banking ING Romania – Banking strategies and services. 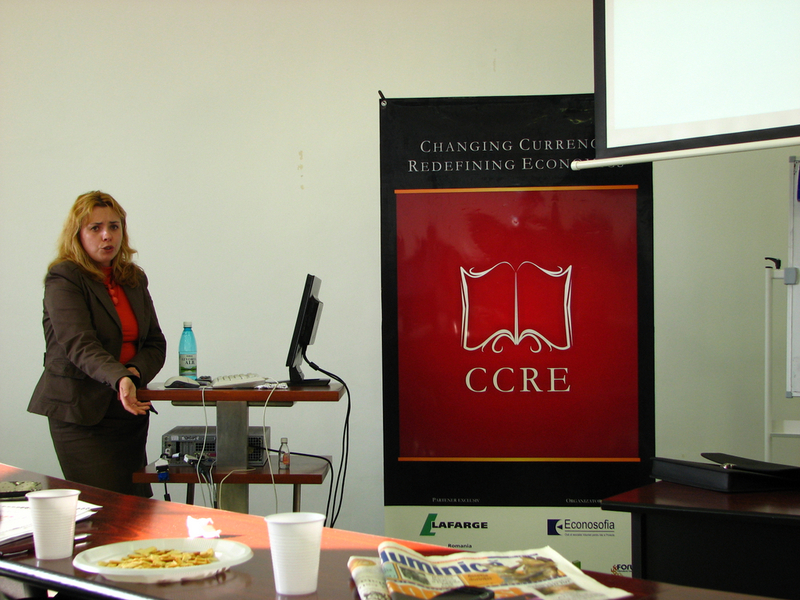 Cristela Moldoveanu – Vice-President Citibank – Banking products and services. Marketing of banking institutions. 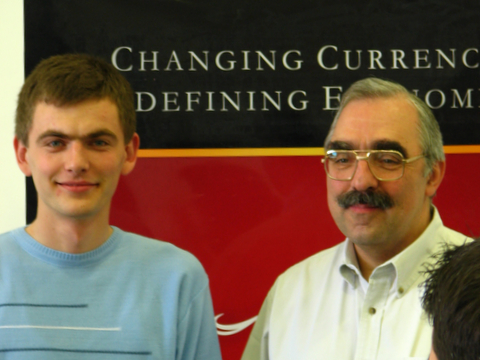 Nicolae Petreanu – Chief economist of Eximbank and Emil Bituleanu – Finansbank Marketing Department – Banking strategies. 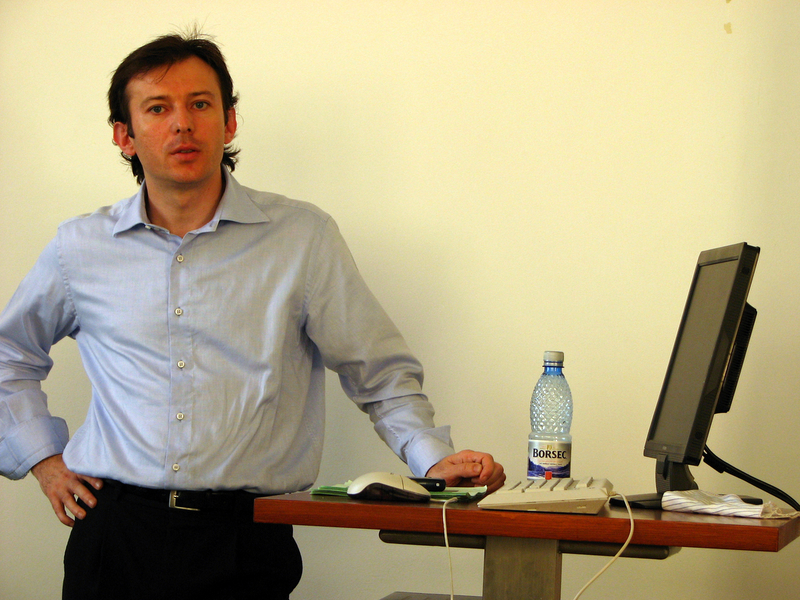 Prof. Lucian Croitoru – advisor to the governor of the NBR and Prof. Cornel Târhoacă – Influences of the macroeconomic environment on the banking system. Prof. Mugur Isărescu – Governor of the NBR – The role of the National Bank of Romania in the process of joining the European Union. Prof. Gheorghe Manolescu – President of the Financial and Monetary Research Institute, Prof. Aurel Berea – advisor to the President of BCR – banking strategies in the recruiting and the training of specialists in the banking industry. Prof. Florin Georgescu – President of the Finance and Banking Commission of the Romanian Parliament – problems of the banking system. Mihai Tănăsescu, Minister of Finance – the impact of the fiscal policies on the development of the banking system. Enache Jiru – deputy secretary of the Ministry of Finance and Paul Prodan – Director Financial Markets & Asset Management – the State Treasury and the banking system. We invited guests from the financial and banking industry, insurance and stock exchanges: NBR, Ministry of Finance, BCR, ARB, Eximbank, ING Romania, UNSAR, BVB, Rasdaq, ANSVM, CNVM, AVAB and APAPS. This year, the internship programs have been made possible in partnership with the National Bank of Romania, the Ministry of Finance, Romanian Stock Exchange and Rasdaq. The internships were held from December till July 2002 with the participation of 54 students. Conference: why the inflation does not go down? With the participation of numerous guests from the software, telecommunication and banking industries.